We bring froth highly efficient Motorized Barrel Pumps in the market. 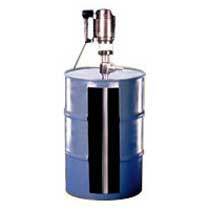 The low viscosity drum pumps are driven by air-operated motors and are widely used for pumping flammable liquids. Motorized Barrel Pumps are fabricated from technically advanced machinery and finest components. The Motorized Barrel Pumps pass all the quality tests under various parameters being delivered to the clients. Avail the superior quality and technically advanced Motorized Barrel Pumps at the most discounted rates in the market.